Welding is a Fabrication Process That Joins Materials, Usually Metals, by Causing Coalescence. The Welding Trade is vast, covering areas from structural steel used in high rises and bridges, the shipbuilding industry, mining, pipelines…virtually every industry employs welders. Are you a “hands-on” person who doesn’t like to sit behind a desk? Do you enjoy meeting challenges and pushing your own limits? Do you have patience and determination? These are qualities that welders need to succeed in their careers. The three modular programs (Welder Foundation, Levels B and A) provide the training required for Provincial Welder certification. Welder Foundation: This program is designed to develop the fundamental skills and knowledge required for initial employment in the welding industry. Level B: This program develops more advanced welding skills and related theory than were taught in the Level C/Foundation program: pipe welding, gas tungsten arc welding, etc., providing graduates with a broader base of skills and more employment opportunities. Level A: This program teaches more advanced welding skills and related theory than were taught in the Foundation/C and B Level programs: pipe welding with stainless steel electrodes, low-alloy steel electrodes, more advanced blueprint reading and welding metallurgy, etc. Part-time Studies Courses: the welding department has a few part-time studies courses available as well. NOTE: Levels B and A are registered through the Welding Department only and Foundation is registered through the admissions department. 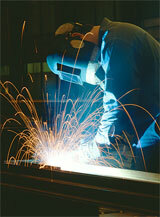 For a full list check out Welding Part-time Studies Courses.